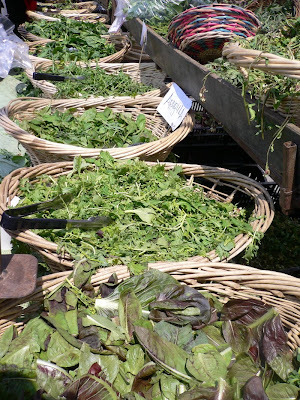 If you're going to the farmers market and want to do some serious shopping, it's best to get there early. Later in the morning you have crowds to deal with (as you can see above) and the likelihood that some items sell out quickly (as below). We lazed about Saturday and didn't have anything in particular we wanted to buy, so getting there late was OK (though the crowds were a bit dense). Plus we were spending the day in the city, so couldn't stock up on anything perishable. To a variety of salad fixings. 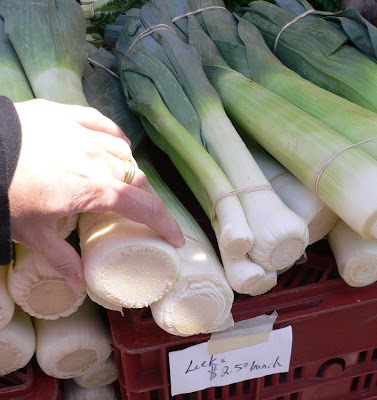 In particular I marveled over the huge and cheap leeks. I couldn't resist: I bought a bunch. 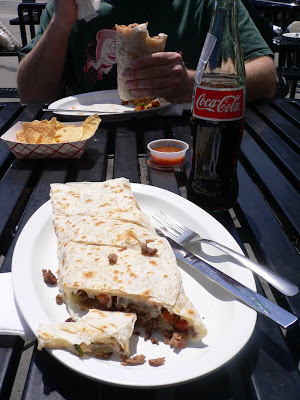 The lines for the prepared-food vendors were pretty long, so we adjourned to a nearby taqueria for lunch, complete with Mexican Cokes (made with cane sugar rather than corn syrup). 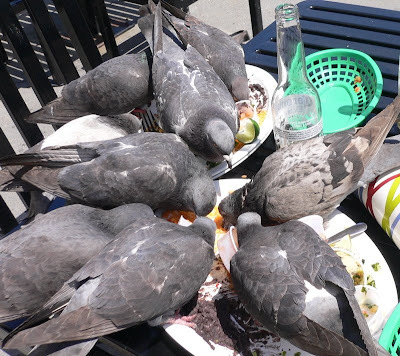 The rats with wings are everywhere, and as soon as diners depart, they move in for a greasy feast. This was a neighboring table; we bused our own when we were done. I love the Ferry Building! Have you ever eaten at The Slanted Door restaurant there? 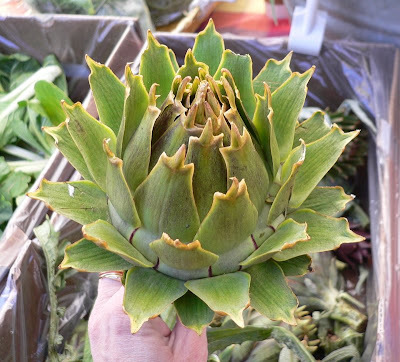 I'm jealous over that unique artichoke, I've not seen it down here yet. 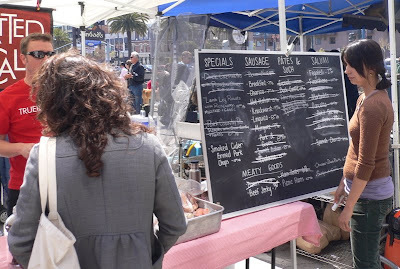 I'll have to go to the big Santa Monica farmers market next week to hunt it down! Exciting selection of leaves! I didn't go there last July when I was in SF. I grew up overseas and have never heard anyone but me call them "rats with wings". ROFLMAO. But, so true. I'm gonna go post your blog link over at my new Yahoo! 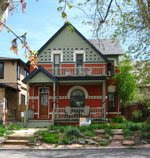 group for Localvores of Colorado, okay? Someone just asked when the farmers markets started over here, so I thought I'd make them jealous. :) Wow, those greens make my mouth water. Those winged rodents are amazing! Even in NYC I don't believe I've ever seen them quite like that. On the other hand, the squirrels at the Grand Canyon will go right in your pocket for food (and bite you too) so maybe different varieties evolve given circumstances? Did you see the signs that say not to feed the birds? They have the signs all over at Pier 39. I need to venture out more in SF, I'm finally getting more comfortable going there. Last time we went there we took Bart from Pleasanton and it was really easy! I am planning on doing that more often. all looks vibrant and gorgeous! except for those pigeons!!! disgusting. hahaha. i was walking around our farmer's market early in the morning the other day as well. Farmers markets are always fun. I can't wait for the fresh local produce to start showing up at the farmers market here. Because of seeing this, I had an artichoke for dinner yesterday AND today. Diane, I think it may have just been an overblown artichoke, though maybe it was a special variety. I've been to "Out the Door," which is the Slanted Door's more affordable restaurant, but in the Westfield Center. Good food! Blue, I was really tempted by all the greens, but I couldn't carry them with me all day, alas. Dani, I know I've heard others call them that! And squirrels are rats with bushy tails. Link away. I'm looking forward to our own markets getting into gear. Alecto, these were some seriously dedicated scavengers. They knew exactly when people were finishing up and started moving in on our table in a menacing way. Creepy. Julie, it really is so easy to get around there. I love the ferry, too. And it was very easy to get to Japantown on the bus. I would never drive there if I could help it. Pinknest, do you go to Union Square? I've never had a chance to really explore that market. Kevin, when do Toronto's markets get rolling? Kathi, I am jealous. I probably should have bought some artichokes there, too. But I contented myself with the leeks. I would have bought a bunch of leeks too, they are very expensive here..